OHANA Waikiki Beachcomber Hotel review. # 43 in our Waikiki map. 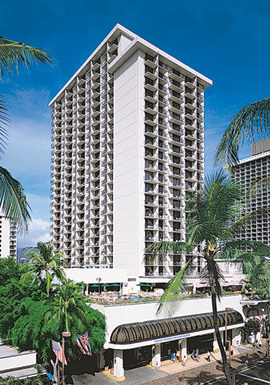 Hotel Name: .... Holiday Inn Waikiki (Beachcomber) Hotel. Address: ......... 2300 Kalakaua Ave. This hotel is located next to the International Market Place, home of the "Magic of Polynesia" show and last home of famous "Don Ho" and "Jimmy Buffet's" restaurant. It was built in the 70"s during the hotel construction "craze" where the majority of the Waikiki Hotel's original structures were erected, changes in the law during the 80's made it impossible to construct the same density per square foot and that is why all these buildings are renovated and re-renovated again, some times spending more money in these face lifts than it would cost to build them new. The Beachcomber is 25 floors tall and has almost 500 rooms, it was independently marketed from the day it opened until the end of 2005 that was taken over by the Outrigger corporation as the OHANA Waikiki Beachcomber, in 2007 the hotel started the first of two phases a profound renovation for several months until it's conclusion in December of the same year. The second and final phase took place in 2008. Finally it went into the Holiday Inn banner at the start of 2010. The Hotel houses several restaurants, bars and stores on the second and third floors as well as a Macy's store on the ground floor. This hotel is number "43" within the red zone of our waikiki map, click here to see it's location in relation to other hotels in Waikiki. 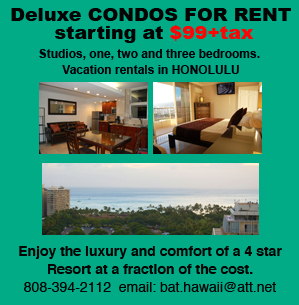 The central location of this hotel is perfect, if you are staying in Waikiki for a couple of days, everybody gravitates to this area after 5 PM. Next to the International Market Place and across the street from Duke's restaurant and bar, it does not get any better than that. The recent renovation has it's rooms felling fresh and new. It is a recognizable name brand, it may not be the best name in the industry but at least you know what to expect. No surprises. CONSTRUCTION ALERT: The International Market Place is under construction and this property sits right next to a very large construction site. If you are going to be in Waikiki for a couple of nights it is OK, anything longer may prove to be a little hectic for most people to be next to the International Market Place. Noise is definitely a problem for this hotel, a combination of factors such as being next to the International Market Place, on a major avenue compounded with the fact that it operates a large night show as well as Jimmy Buffet's restaurant and bar that plays loud music until late hours can make this place a little too much to bear. The swimming pool is very small, without much of a sundeck and a little crowded next to Jimmy Buffet's bar and restaurant so so enjoying a quiet afternoon by the pool may not be an option. The hotel has basically 4 different room categories, all rooms were part of the renovation but if you can, try to stay away from the standard rooms, those are smaller than the rest and are located on the lower floors facing an alley . The hotel lobby is on the second floor but there is and escalator from the ground floor as well as elevators, so it should not affect you if you have mobility problems.